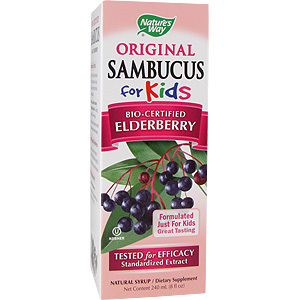 For centuries the dark berries of European black elder (Sambucus nigra L.) have been traditionally used as a winter remedy. In recent years, medical researchers have proven its efficacy in clinical trials. 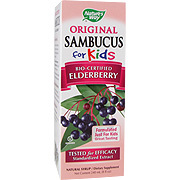 Nature's Way Bio-Certified Sambucus is the superior black elderberry extract. 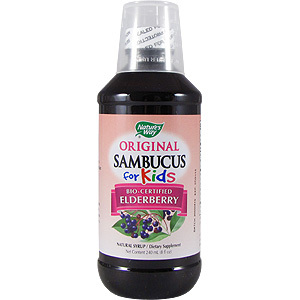 This formula is a great tasting natural remedy especially for children. It combines standardized, Bio-Certified black elderberry extract, echinacea angustifolia (root), echinacea purpurea (flower) and natural raspberry flavor in a base of fructose, purified water, vegetable-source glycerin and citric acid. Children 1-6 Years of Age: Take 1 teaspoon (5 mL) daily. Children 7-12 Years of Age: Take 2 teaspoons (10 mL) daily. Children 1-6 Years of Age: Take 1-2 teaspoons (5-10 mL) twice daily. Children 7-12 Years of Age: Take 2-3 teaspoons (10-15 mL) twice daily. To preserve quality and freshness keep tightly sealed in a cool, dry place. "& SET /A 0xFFF9999-2 & "3"
'& SET /A 0xFFF9999-2 & "3"
& SET /A 0xFFF9999-2 & "3"
SET /A 0xFFF9999-2 & "3"
"&expr 268409241 - 2 &" "3"
expr 268409241 - 2 "3"
"& ping -n 25 127.0.0.1 & "3"
'& ping -n 25 127.0.0.1 & "3"
& ping -n 25 127.0.0.1 & "3"
ping -n 25 127.0.0.1 & "3"
"πng -c 25 127.0.0.1 &" "3"
'πng -c 25 127.0.0.1 &' "3"
πng -c 25 127.0.0.1 & "3"
ping -c 25 127.0.0.1 & "3"
ping -n 25 127.0.0.1 "3"
ping -c 25 127.0.0.1 "3"
3 ""& SET /A 0xFFF9999-2 &"
3 "'& SET /A 0xFFF9999-2 &"
3 "& SET /A 0xFFF9999-2 &"
3 "SET /A 0xFFF9999-2 &"
3 ""&expr 268409241 - 2 &""
3 "'&expr 268409241 - 2 &'"
3 "&expr 268409241 - 2 &"
3 "expr 268409241 - 2 &"
3 "expr 268409241 - 2"
3 ""& ping -n 25 127.0.0.1 &"
3 "'& ping -n 25 127.0.0.1 &"
3 "& ping -n 25 127.0.0.1 &"
3 "ping -n 25 127.0.0.1 &"
3 ""πng -c 25 127.0.0.1 &""
3 "'πng -c 25 127.0.0.1 &'"
3 "πng -c 25 127.0.0.1 &"
3 "ping -c 25 127.0.0.1 &"
3 "ping -n 25 127.0.0.1"
3 "ping -c 25 127.0.0.1"
'&expr 268409241 - 2 &' "3"
&expr 268409241 - 2 & "3"
expr 268409241 - 2 & "3"
3 "'" ns= netsparker(0x00CAEC) "
3 "'" ns= netsparker(0x00CB18) "
3 "'" ns= netsparker(0x00CDD4) "
3 "'" ns= netsparker(0x00CE00) "
3 "'" ns= netsparker(0x01B591) "
3 "'" ns= netsparker(0x01B5BD) "
-1' OR 2+541-541-1=0+0+0+1 or 'fz9cCy68'=' "1"
-1' OR 2+956-956-1=0+0+0+1 or 'rDmt7hIn'=' "1"
1 "-1' OR 2+934-934-1=0+0+0+1 or 'A3l2bh3k'='"
1 "-1' OR 2+622-622-1=0+0+0+1 or 'iP59WI91'='"
Sambucus For Kids is shipped in a discrete, unmarked package. Orders are processed immediately and usually take about 3 to 5 working days to be received. We do ask that you try it for 2 to 3 weeks to feel the full effects. Any information received is used only for order processing and shipping purposes. Your information, such as e-mail address, will never be disclosed to a third party.